Pic’s peanut butter, valued at $8.99 for 380g. Pic’s peanuts were pre-roasted which gave them “the best taste and texture, by far”, according to journalist Catherine Gaffaney. Taster Gabrielle Feather said the roasted buttery flavour had an “earthy” taste, giving it a five out of five. Organic fairtrade bananas valued at $4.25 per kilo. 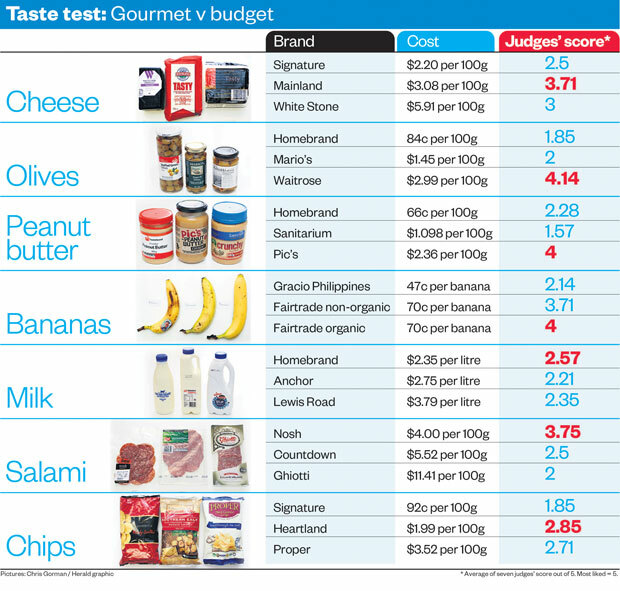 Tasters found it difficult to taste the difference between the bananas, partly due to inconsistent ripeness – but a winner came out on top due to its “fresh and flavourful” taste, said Dean. The ordinary fair-trade mid-range banana came in at a close second, Ms Sullivan commenting that both bananas had “good flavours”. Homebrand Milk valued at $2.35 a litre. Most tasters had trouble with distinguishing difference in the milk, with Homebrand winning with 2.57 out of five average score compared to Lewis organic milk’s 2.35. Despite the low average ratings, some tasters enjoyed homebrand milk the most for its creamy texture and what Ms Sullivan described as a “smooth” flavour. Nosh Bertoc Milano Salami valued at $4.47 for 112g. The high-end salami came out on top here described as having a full flavour and less oily than its rivals. Ms Witton gave it a four out of five rating due to its “salty, sharp, peppery” flavour and its good texture. Heartland chips valued at $2.99 for 150g. These chips had a surprisingly good flavour for plain ol’ salt crisps, but they only just made the grade at 2.85 average with Proper gourmet chips coming in a close second at 2.71. This entry was posted in Chalkidiki Olives, Inolivia olives, R&D, Statistics and tagged CHALKIDIKI GREEN, Chalkidiki Green Olives, Chalkidiki Olives, inolivia, INOLIVIA pitted, Inolivia Rich Olive Flavours. Bookmark the permalink.